As eggplants are in season right now, I cook a lot of eggplant dishes. This is the dish I like to cook when I have really fresh eggplants (choose short and shiny ones when you shop). This is a very simple recipe but you need fresh vegetables for this type of dish. You can use local vegetables, such as loofah (yes, we eat this in Okinawa) and papaya too. ½ cup dashi broth (bonito or kelp, both OK) – the broth in the picture is bonito based. 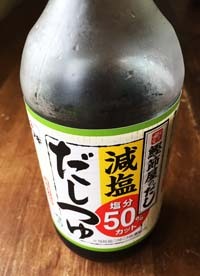 What you need to look for in a local supermarket to buy this is だしつゆ (dashitsuyu). This particular one you can use as is, but some dashitsuyu you find at local supermarkets need to be diluted with water. 1. Peel off the skin of the eggplants and cut them lengthwise and then into halves. 2. Soak the eggplants in water for 5 minutes. 3. Steam-cook the eggplants until they’re cooked. 4. Place the steamed eggplants in a dish and pour in the broth. 5. Garnish with bonito fish flakes and scallions. Tuesday group starts Sep. 1st and Saturday group is from Sep. 5th. 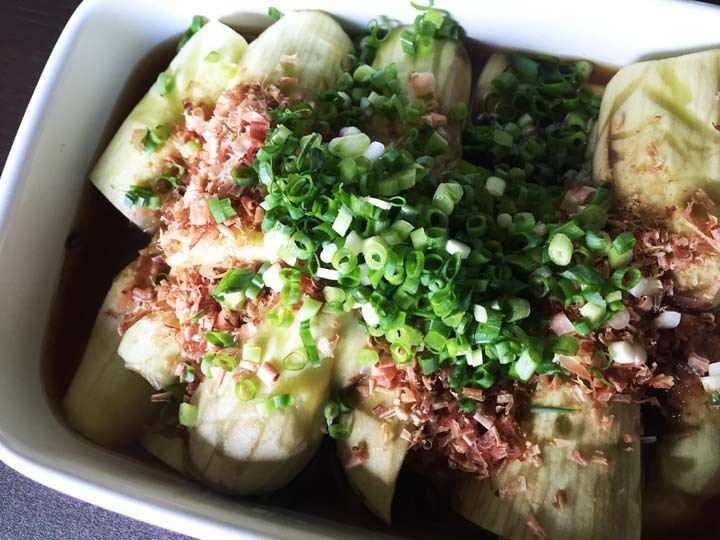 Learn how to cook Okinawan dishes from basics. Fun and very informative cooking class.